When the weather cools off, climbers start hitting the rock. 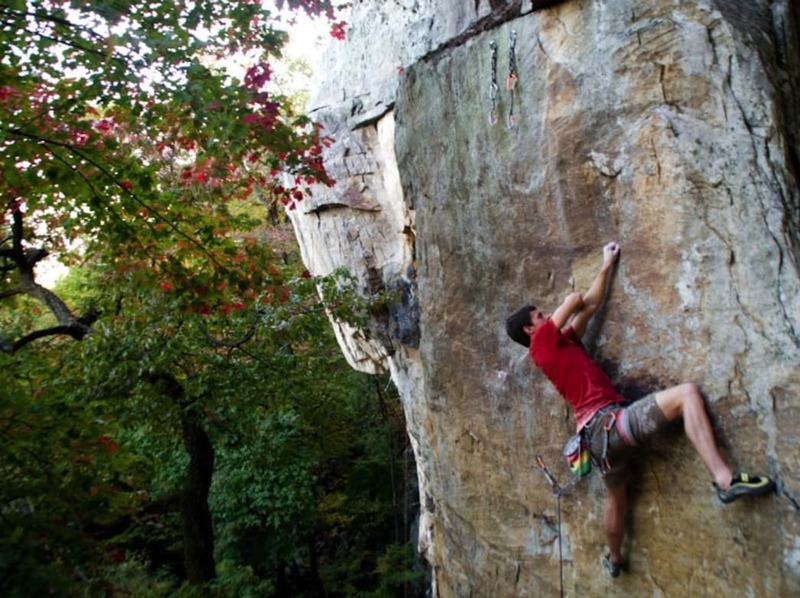 Don’t get us wrong, there are great climbing opportunities around Chattanooga year-round. But with fewer crowds and more comfortable temperatures, winter is an excellent time to take advantage of the rock climbing opportunities in the area. Here are some of our favorite spots. The Tennessee Wall (T-Wall to locals) is about a 30-minute drive from downtown Chattanooga on the rim of the Cumberland Plateau above the Tennessee River Gorge. It’s considered one of the best places to climb in the winter since the wall faces southwest, allowing for full sun exposure. The views of the Tennessee River Gorge from T-Wall are stunning, and they never get old for the climbers who fall in love with this special place. 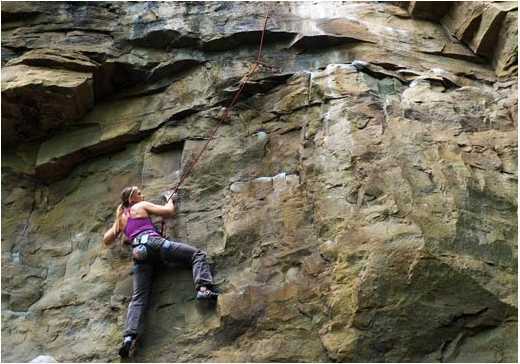 T-Wall is known as one of the premier traditional (trad) climbing destinations in the Southeast, with miles of sandstone offering about 600 routes ranging from grades of 5.5 to 5.13, plus a few sport routes for those climbers who enjoy higher-end sport climbing grades. Climbers will find a wide variety of climbs but T-Wall is known for some of the most beautiful crack climbs. There is only one way up to the base of the cliff line and it takes about 30 minutes to get there. The trailhead and the majority of the cliff line are part of the Prentice Cooper State Forest and Wildlife Management Area and the Tennessee River Gorge Trust. Since it is part of a Wildlife Management area there are seasonal closures and scheduled hunts, climbers will want to make sure to check here before planning a visit. Visitors may want to pick up the Dixie Cragger’s Atlas or the newest guidebook specific to T Wall, The Tennessee Wall: A Rockclimber’s Guide before making the trip as well. Castle Rock is located about 30 minutes from downtown Chattanooga in Jasper, Tenn., on the rim of the Cumberland Plateau. It also features a cliff line facing south, allowing for full sun exposure in the winter. Climbers will enjoy views of beautiful Sequatchie Valley and the Tennessee River. 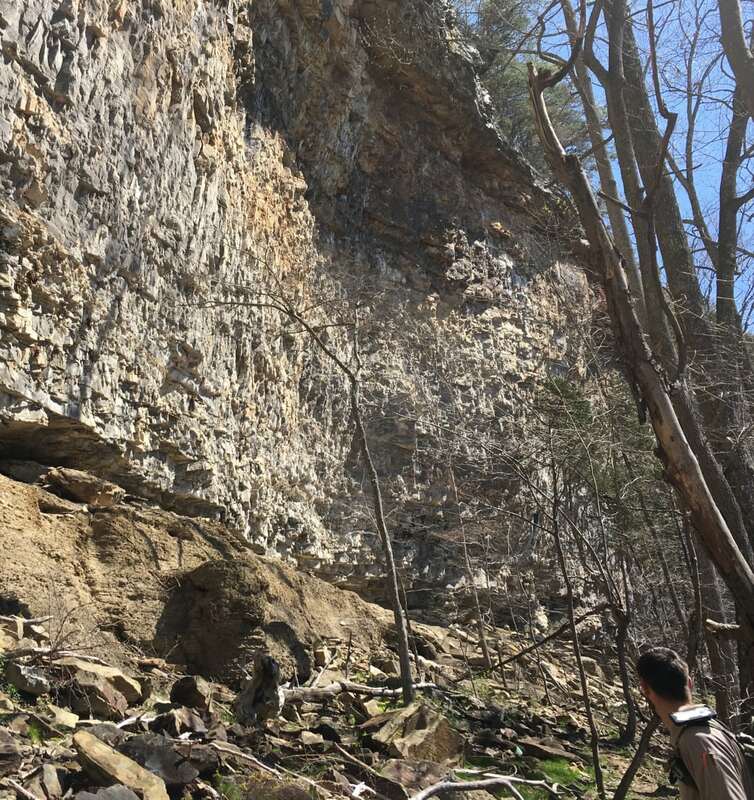 The sandstone cliff stretches nearly a half mile with most of the bluff lines as tall as 80 to 120 feet offering about 100 sport and trad routes ranging from grades 5.7-5.14, with most of the routes between 5.11-5.12. Castle Rock was once one of those cliff lines that climbers could only admire from afar since it is located on private property. But through the diligent efforts of the Southeastern Climbers Coalition, this is no longer the case. 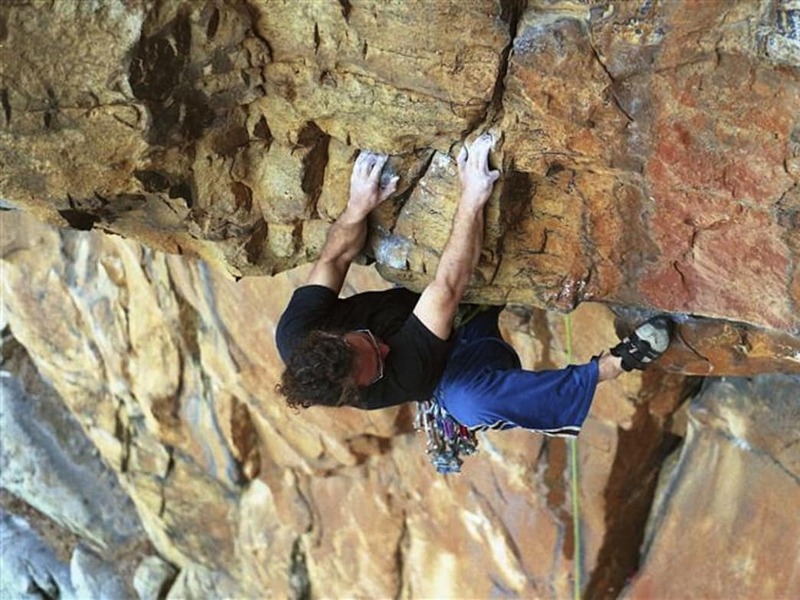 Castle Rock is home to some of the South’s hardest and most classic sport climbs, and since the Southeastern Climbers Coalition involvement it has added a large number of high-quality, moderate sport climbs that have made Castle Rock a more diverse crag for climbers of all levels. Climbers will find everything from face climbs, slopers, side pulls, slabs, and overhanging rock. Climbers are asked to pay close attention to signage and specific guidelines when visiting as climbers are guests. The approach takes about 10 minutes. Foster Falls is located about 40 minutes from downtown Chattanooga, and although it isn’t considered the best place for a really cold winter day, it does get enough sun throughout the day to be considered a year-round crag. Foster Falls is located in the South Cumberland State Park, and it is a little different than some of the other crags around Chattanooga since the base of the cliff line sits in a beautiful forest. The cliff line stretches about 2 miles and offers some of the best sport climbing in the Southeast with most routes in the 5.10+ range. Climbers who want easier or harder routes can also find them here. You can take on everything from technical climbs that require balance to strenuous wall and overhanging roof climbs averaging more than 60 feet. The hike getting to the crag is along the famous Fiery Gizzard Trail and is half the beauty of the trip, as you walk right by the waterfall that gives the area its name.